A Luxury Napa Valley Bed and Breakfast in California Wine Country 1801 First offers elegant Napa lodging, Napa spa packages, and romantic California getaways. 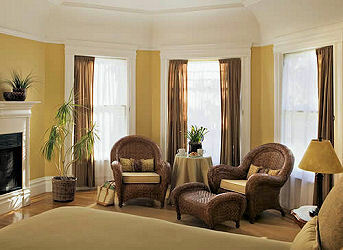 Guests can choose from five spacious suites, two cozy cottages or the premium, private Carriage House. Each is stylishly appointed and features generous amenities. Exquisite beds are lavishly adorned with fine sateen linens, Egyptian cotton coverlets and feather down comforters. Romantic fireplaces and inviting sitting areas encourage lazy, tranquil afternoons. Each of the private, luxurious baths features an oversized soaking tub and spacious, separate shower or whirlpool Jacuzzi. Sensual bath amenities and soothing robes complete the suite experience. This and other Napa Bed and Breakfast Inns can be found here online in The Register.